Microsoft took the opportunity Wednesday afternoon at the IDF 2011 to showcase some of its upcoming features for the highly anticipated Windows 8 user interface designed for tablet and multitouch use. Referred to as a Metro-style design, the UI displays a grid of applications arranged in a 3x3 tile formation. Multiple “pages” of these tiles exist so users can scroll through multiple apps as needed. Specific apps such as weather, current events, restaurant locator and simple games were amongst those shown. While the demonstration 11.6-inch Samsung tablet included a built-in GPS, its restaurant locator humorously and incorrectly gave results for restaurants around Las Vegas, a good 900+ kilometers away. 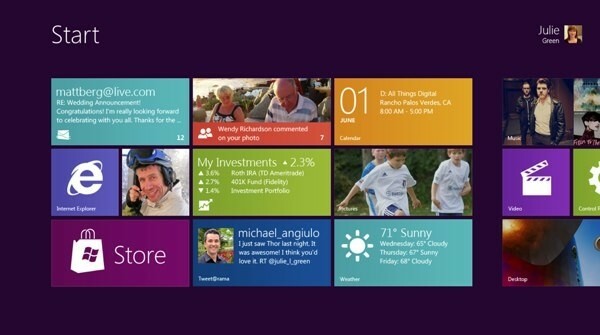 Nonetheless, the colorful UI was very sleek, especially with its included Internet Explorer. Here, Microsoft demonstrated its multitasking “Snap” feature, where users can access different functions of the fly depending on which edge of the tablet screen they are swiping in from. For example, swiping down from the top of the screen will show all browser tabs, swiping right from the left edge shows currently active programs and apps, and swiping left from the right edge brings up the ever-useful search function. Designed from the ground up to be “fast and fluid”, the interface appeared quite intuitive as well. While all Windows 8 tablets should be able to run the Metro-style UI natively, some will not feature the multitasking “Snap” function at all. According to the Microsoft spokesperson, the tablet screen resolution must be at least a native 1366x768 pixels, otherwise the feature would not be present. Whether or not a different method of multitasking would be implemented was not mentioned. Tablets with the Windows 8 OS won’t be coming until next year at the earliest, but the interface so far is seemingly already running smoothly even at its pre-beta stages.